On to the nails. I used a nail art technique where you draw squiggles through polish painted on a surface (In this case, the Uber Mat). The result is an abstract wire-look. Once the polish and top coat dry it can be applied like a decal onto the nails. 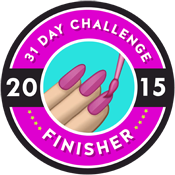 The next challenge, which I hope to post later today, is nail art inspired by a flag.